Don’t miss the first meeting of Static and Black Lightning, Blue Beetle and Hardware, The Spectre and Xombi and more titanic team-ups from THE BRAVE AND THE BOLD #24-26, plus stories from HARDWARE #16, STATIC #12 and XOMBI #6. That’s DC’s catalog description of the latest TPB collection of The Brave and the Bold. In this case, it collects a three-issue arc teaming DC characters and Milestone characters, backed up with three single-issue reprints from the Milestone line. My contribution to the volume is the Static issue, one of the two stories I wrote for Milestone (the other being Icon #11). I got to work with artist Neil Vokes, which is always fun, and like we did with Ninjak, we got to do a kind of young-Spider-Man-ish story, with a lot of personality, action, energy and ethical dilemmas, this one introducing the villain (or is he?) D-Struct. D-Struct also appeared in the Static Shock cartoon, though I never actually saw that episode. I’m happy to see the story coming back into print—it’s not that often that you see one-off fill-in issues from 16 years ago get a new life—but this was a story we were pleased to do and pleased with the results, so I’m glad it’ll get seen by some new eyes. The rest of the book’s good stuff, too. 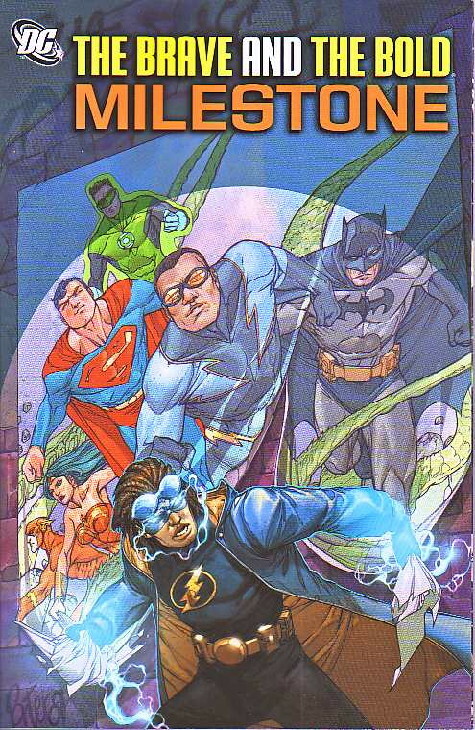 This entry was posted in Comics and tagged d-struct, milestone, neil vokes, static by Kurt Busiek. Bookmark the permalink.